I ran across some cool information about the country Venezuela recently during some cultural exchange event, and I thought it would be great to share those info with you, although I have never been to it. You can say Venezuela is a coffee corner; it’s located in the north of South America, it’s a blessed earth for the sowing of the noble seed of coffee. In the plantations, big trees serve as homes to hundreds of migratory birds and provide the shade required for the bush of the coffee. At one time, Venezuela ranked close to Colombia in coffee production, but as petroleum turned Venezuela into the richest country in South America, coffee was relegated to the economic back burner. Today it produces less than one percent of the world’s coffee, and most of it is drunk by the Venezuelans themselves. Now that petroleum has failed to bring lasting prosperity, the Venezuelans government is attempting to promote coffee growing and exporting again as a means of diversifying and stabilizing its economy. The best Venezuelan coffee comes from the far western corner of the country, the part that borders Colombia. Coffees from this area are called Maracaibos, after the port through which they are shipped. Coffees from the coastal mountains farther east are generally marked Caracas, after the capital city, and are shipped through La Guaira, the port of Caracas. 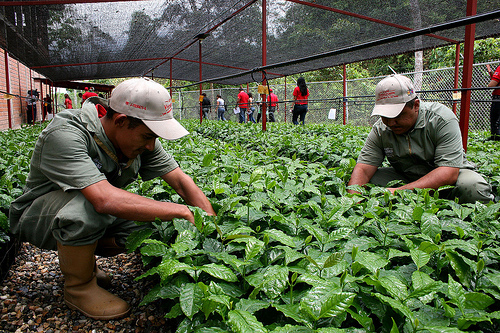 The best-known Maracaibo coffees, in addition to Cucuta, are Merida, Trujillo and Tachira. Merida is the most distinctively Venezuelan and most likely to be found in specialty stores in the United States. The most characteristic Venezuelan coffees, in surprising contrast to the neighbor coffees from Colombia , are strikingly low in acidity. At worst they are spiritless, at best sweet and delicate.The finest, such as the Meridas, have fair to good body and an unemphatic but pleasant flavor with hints of richness. Venezuelan, if you can find it, is a good coffee to balance sharply acid coffees in blends and a comfortable coffee drunk straight. The combination of the grain harvested in the Andean mountains, the central valleys and the coasts of the Caribbean sea , are in a rich unique mixture in aroma, flavor and body characteristic of the best coffee. The work of the coffee properties is carried out in an essentially handmade way, from the preparation of the land and sowing until the gathering of the grain. In the small parcels the manpower is mostly family and journeymen are only hired for the crop. Popular music in Venezuela emanated from a meeting of three cultures: the five-thousand-year-old musical traditions of the indigenous peoples became mixed with the Arab-Andalusian songs and dances of the Spanish conquerors and the complex sound patterns of the music of the African slaves forced to work along the Caribbean coast of Venezuela. These manifold ethnic and multicultural melting-processes turned Venezuela into a country of Mestizos. The complex tones, the numerous rhythmic variations and the virtuosity it demands of the singers of its folk poetry, have made Venezuelan folk music one of Latin America’s most attractive. Prominence is given here to the national instrument, the cuatro, a small, multi-stringed guitar that requires a high degree of musicality and dexterity. Other string instruments included on this recording are the guitar, the mandolin, the bandola, the Harp, plus drums and maracas. Perhaps the most typical Venezuelan music is Joropo, a rural form which originated in the Llanos, or plains. 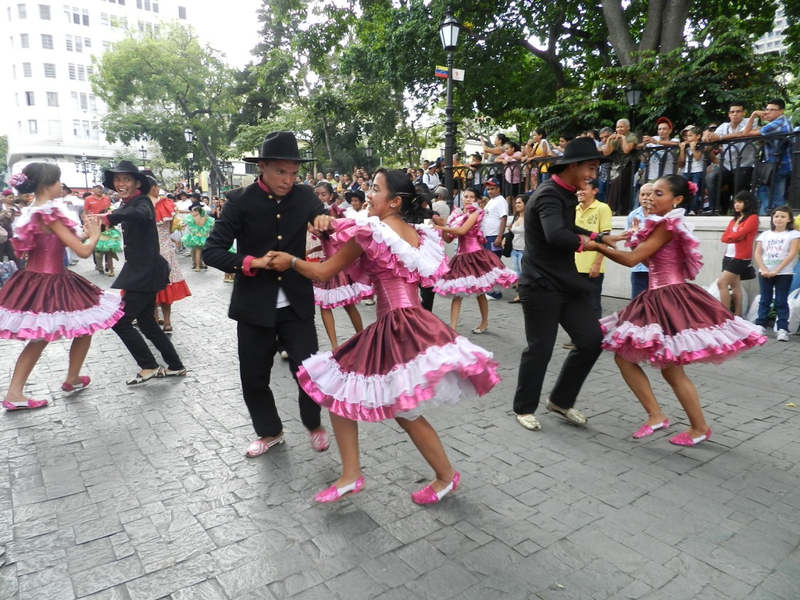 The word Joropo encompasses a tradition which includes village fiestas, poetry, singing, music and dance in a form of a popular expression which is constantly evolving. Improvised creativity flourish on existing structures and defined patterns of style. Joropo music has become a genre for great solo virtuoso performances on the leading melodic instruments: harp or bandola, which is a four-string lute, while the accompaniment is with the cuatro, which is a Four-string strummed small guitar, and the maracas. Singers improvise rhymed verses which refer to historical or daily events; the instrumentalists search for new percussive sounds and textures through constant variations, improvisation being at the heart of Joropo music.